FairMormon is arguably the leading Mormon organization devoted to defending the LDS religion. Every year it holds a conference in which Mormon scholars and apologists present papers of relevance to the defense of Mormonism. As an evangelical scholar engaged in research, writing, and ministry in relation to Mormonism, I try to keep up with what FairMormon does and have made frequent reference to its online materials. 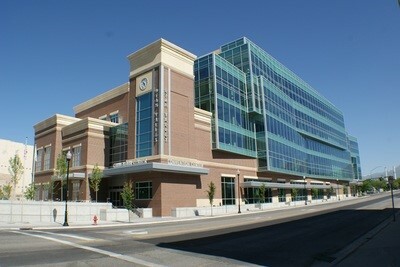 I attended its 2012 conference and this year was able to attend its 2017 conference on August 2nd and 3rd, held at the Utah Valley Convention Center in Provo, Utah (pictured here). You can read a complete list of the FairMormon conference speakers and presentations online. In this brief article I will not be commenting on all of the presentations but only on several of those relating to the Book of Mormon. Indeed, one noteworthy fact about the conference was that a great deal of attention was given to the Book of Mormon. Five of the fourteen presentations were specifically focused on the Book of Mormon and other presentations included some material about it. This emphasis on the Book of Mormon is consistent with the LDS Church’s general emphasis, since it treats the Book of Mormon as its foundational scripture, the gateway for converts to come to faith, and the focus of a person’s “testimony” to the truth of Mormonism. It is for this reason that I have been devoting most of my research and writing in the past several years to this subject, as you can see from the Book of Mormon section of our ministry’s website. All of the presentations focused on the Book of Mormon were rather well done. For the most part, Mormon defenses of the Book of Mormon have become quite sophisticated, and this was certainly evident in these conference presentations. However, this doesn’t mean I think their defenses hold up. Four themes from these presentations stood out that merit some comment. Some of the presenters made reference to the fact that the LDS Church has stated that it “has no official position about Book of Mormon geography except that the events occurred in the Americas.”1 In effect, the LDS Church’s official position is that it has no official position on Book of Mormon geography. This stance is prompted by two factors: no position can be substantiated factually, and the LDS Church does not want to alienate the many members who reject the Mormon academic consensus in favor of a Mesoamerican (Central American) location. As conference speakers mentioned, there are Mormons who think that the Book of Mormon lands were in Mesoamerica, the Great Lakes region, Baja California, or Peru. It was fascinating to hear speakers virtually tiptoeing around the question. Tyler Griffin’s presentation on the second day of the conference (one of the weakest of all the presentations) argued that the Book of Mormon’s geographical descriptions are “internally consistent” while ignoring the question of their consistency with any external location in the real world. Even Ugo Perego, a Mormon geneticist who clearly dislikes the Great Lakes or “Heartland” model of Book of Mormon geography and soundly refuted a popular genetic argument for it, meekly allowed for the possibility that it might end up being true. Mormons commonly respond to criticisms of the Book of Mormon’s lack of support from archaeology by arguing that the mere lack of evidence for specific cities, animals, technologies, or events does not mean they didn’t exist. This point was strongly emphasized by Neal Rappleye in the opening presentation on the first day. The argument is based on the dictum, made famous in biblical studies by Egyptologist and evangelical Old Testament scholar Kenneth Kitchen, that “absence of evidence is not evidence of absence.”2 But there are two huge problems with this defense. First, it equates lack of evidence for specific elements in the text with lack of evidence for the whole of its narrative. We do not need to be able to provide archaeological evidence that Joseph of Arimathea existed to view the Gospels as historically authentic and credible. It would be an entirely different matter if we had no evidence outside the Gospels for the existence of Israel, Jerusalem, and the entire Jewish people. We may never find convincing external evidence for the existence of the Genesis patriarch Abraham, but we do have external evidence proving that people like Abraham lived in that period of time, that they did the kinds of things that Abraham did, and that the major locations and people groups mentioned in the Genesis account of Abraham were real places (e.g., Canaan and Egypt).3 The problem with the Book of Mormon is not that we cannot pinpoint or confirm the existence, say, of the city of Zarahemla or the prophet called Alma the Younger; the problem (on this issue of lack of evidence) is that we cannot confirm the existence of any of its locations, any of its figures, or even of the Nephites at all, despite the fact that the Book of Mormon presents them as building a civilization that covered the land for nearly a millennium. Of course, it is obvious that there is no confirmation even at this level of the “big picture” if the LDS Church cannot even commit itself to a regional location for that civilization. Third, several speakers argued that various kinds of terms or descriptions in the Book of Mormon that seem problematic to us might not mean what they seem. This might have been the dominant theme of the conference. Neal Rappleye, Michael Ash, and Ben Spackman both gave special attention to this idea, although Spackman’s focus was mainly on the Bible and he commented only briefly on the Book of Mormon. One way in which LDS apologists attempt to explain many of the problematic descriptions in the Book of Mormon is by suggesting that they are instances of “loan-shifting.” A commonly cited example is the coining of the Greek word hippopotamus, which literally meant “river horse,” even though the hippopotamus is not a horse. Rappleye mentioned this example and then suggested that the principle might explain the Book of Mormon’s references to horses and chariots. He proposes that the terms might refer to dogs (called “horses”) that walked alongside litters (called “chariots”) on which royal figures were carried by men. In the Q&A at the end of his presentation, someone asked Rappleye why the dogs weren’t just called dogs. Rappleye had to admit that he didn’t have an answer. This was clearly the weakest moment in an otherwise very well done presentation, even though I disagree with him on the larger issues. Mormons have often made the observation that although the Book of Mormon mentions horses and chariots in the same context, it never actually says that the horses pulled the chariots. This is a rather lawyerly parsing of the text. Horses and chariots are spoken of together seven times in five separate passages in the Book of Mormon (2 Nephi 12:7; Alma 18:9, 10, 12; 20:6; 3 Ne. 3:22; 21:14). Chariots are never mentioned except in close association with horses. The repeated correlation of horses and chariots in these passages leaves no real doubt that the horses moved the chariots. Just as it would be ad hoc to claim that references to “ox and plough” do not mean that the ox pulled the plough, it is ad hoc to claim that references to horses and chariots in the same immediate context do not refer to horses that pulled the chariots. Moreover, two of these Book of Mormon passages are actually quoting Old Testament texts where we know that actual horses and chariots were meant (2 Nephi 12:7 = Isaiah 2:7; 3 Nephi 21:14 = Micah 5:10). It isn’t plausible that these terms mean horses and chariots when the Old Testament is being quoted but dogs and litters everywhere else. So while the text may not actually “describe” horses pulling chariots, it clearly enough does speak of horse-drawn chariots. Gardner’s question presupposes that whether Joseph used one rock or another doesn’t matter because either way what he did was miraculous. That is, it would be miraculous for Joseph to produce the Book of Mormon whether he was using the stone in the hat or reading the plates through stone spectacles. But this is an assumption that needs to be reexamined. I propose a different way of understanding Joseph’s method based on the fact that the stone in the hat never actually worked for Joseph when he was looking for buried treasure. In my view, it was a device that manipulated people into thinking that Joseph was seeing something they could not see. The purpose of looking at the stone with his face in the hat was not really to prevent outside light from interfering with what Joseph saw, but to prevent people from seeing that in actuality nothing was happening with the stone at all. Of course, faithful Mormons will find this explanation absurd: How could Joseph have dictated the entire Book of Mormon off the top of his head with his face buried in a hat? But this question also makes an assumption that needs to be reexamined. Granted that we have reports of Joseph dictating large portions of the Book of Mormon with the stone in the hat, we do not have information specific enough to warrant the assumption that this is how the entire book was dictated (even assuming the witnesses all told the truth). On the other hand, we don’t have any reports to support the idea that parts of the Book of Mormon were dictated in some other way. In short, the testimonial evidence of those who reported watching Joseph dictate the Book of Mormon is insufficient to answer the question one way or the other. We must then look at the internal evidence of the Book of Mormon text itself. When we do, what we find is that Joseph Smith made heavy use of the King James Version of the Bible in producing a great deal of the Book of Mormon, at one point reproducing twelve chapters of Isaiah in a row almost verbatim. Thus, the issue of how Joseph produced the Book of Mormon may require a complex answer that allows for different methods at different times. He may have indeed dictated a great deal of it extemporaneously with his face buried in his hat, and the non-biblical passages of the Book of Mormon actually fit that explanation very well (long, run-on sentences, excessive repetition, and the like). He may have dictated the biblical passages with a Bible in hand, making occasional changes as he went along (usually of a minor nature, just as plagiarists commonly do). There is one reason and one reason only why it is difficult to know for sure how he did it: Joseph refused to give any explanation or to show anyone how he did it. The best explanation for his secretiveness in the matter was that the stone in the hat was nothing more than a magician’s trick. 1. Book of Mormon Seminary Teacher Manual (Salt Lake City: Church of Jesus Christ of Latter-day Saints, 2012), 196–98. 2. E.g., Kenneth A. Kitchen, “The Patriarchal Age: Myth or History,” Biblical Archaeological Review 21 (March/April 1995): 50. 3. See, for example, Kenneth A. Kitchen, On the Reliability of the Old Testament (Grand Rapids: Eerdmans, 2003), 313–72; Iain Provan, V. Philips Long, and Tremper Longman III, A Biblical History of Israel, 2nd ed. (Louisville: Westminster John Knox Press, 2015), 156–71. 4. Standard academic reference works that provide wide-ranging information supporting these statements about ancient Mesoamerica include Archaeology of Ancient Mexico and Central America: An Encyclopedia, edited by Susan Toby Webster and David L. Webster (New York: Garland, 2001); The Oxford Encyclopedia of Mesoamerican Cultures: The Civilizations of Mexico and Central America, Davíd Carrasco, editor-in-chief (Oxford: Oxford University Press, 2001); Michael D. Coe, The Maya, Ancient People and Places, 8th ed. (New York: Thames & Hudson, 2011); The Southern Maya in the Late Preclassic: The Rise and Fall of an Early Mesoamerican Civilization, edited by Michael Love and Jonathan Kaplan (Boulder: University Press of Colorado, 2011); and The Oxford Handbook of Mesoamerican Archaeology, edited by Deborah L. Nichols and Christopher A. Pool (Oxford: Oxford University Press, 2012). 5. For a thorough discussion of this point, see Robert M. Bowman Jr., “Joseph Smith’s Seer Stone” (Cedar Springs, MI: Institute for Religious Research, 2015).